Mad Fox presents a restaurant experience that is like an English Gastropub or European Brasserie – casual dining with an emphasis on high-quality food that complements the Mad Fox beers. As part of the brewpub concept, elements of the brewery are integrated into a full-service restaurant and bar. The restaurant occupes 9,239 interior square feet plus the outdoor terrace area. 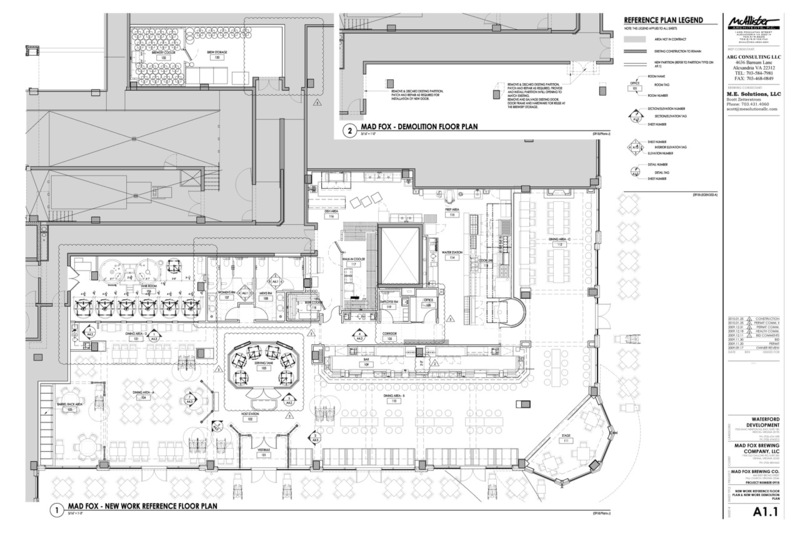 The serving areas are divided between the Dining Room, Pub, Saloon and outdoor Terrace. The total indoor dining seating is approximately 225 seats with space for up to 100 people in the bar area of the Pub. The outdoor terrace will be able to seat up to 80 people, weather permitting. Mad Fox offers casual dining with hostess-seated table service. Guests are seated by the hostess who also maintains a wait list. The layout and breakdown of our 9,239 square feet of space has been finalized and the floor plan below shows the layout as it is being framed out as of February 22, 2010. The seating shown in the floor plan is notional and the actual seating will be laid out as described in the subsequent sections on the Dining Room, Pub, Saloon and outdoor Terrace. The foyer and entryway feature soft wood and glass partitions and a tin finish ceiling with two sets of double doors to reduce chill winter breezes. Directly behind the hostess stand there are featured six 15-barrel stainless steel serving tanks holding up to 2,790 gallons, equivalent to 90 half kegs, of Bill’s fresh house-brewed beer. To the left of the entry way is the dining room and to the right is the Pub. The entry way ceiling is lower than the surrounding ceiling to act as a sound trap to manage the noise from the bar area and keep the dining room sound levels down. The dining room is Mad Fox’s quieter dining space. With 102 dining seats, it provides a roomy space for friends and family to take their time enjoying Bill’s house-brewed beers and root beer along with lunch and dinner. The space is separated from the rest of the restaurant and can be booked for special events. Features of the dining room are three large picture windows overlooking the brewery, exposed barrel room with wooden barrels filled with very special beer aging in racks and natural light from full length windows looking out to the Market Square. The Mad Fox Pub area is our most exciting space with seating for 130 patrons, standing room for another 50 and direct access to the West Broad Street Terrace. The seating breaks down to dining seating for 88 at booths and high-top tables and 42 bar stools at the bar and along the West Broad Street windows. The Pub stretches the longest length of Mad Fox, from the main entrance to the West Broad Street face of the building. It features a 62+ foot long custom built bar with three service stations each of 12 traditional draught beers. The bar features dedicated patron serving stations at each end for walk up Pub-style service. In the bar back there are two glass-fronted cases chilled to cellar temperature featuring six cask conditioned proper Real Ales served through six water jacketed Angram beer engines, ensuring that every pint is served properly conditioned at cellar temperatures. The bar, back bar, columns and other custom millwork is cherry-stained rock maple. There will be two discreetly placed television screens to display sporting events placed above the bar, above the normal patron sight-line with closed captioning and no audio, so that they do not impinge on the Pub experience. In addition to Bill’s house-brewed beer, Mad Fox will offer full cocktail service and a value-priced wine list. The Saloon is placed in the space directly along West Broad Street, at the toe of Mad Fox’s L-shaped space. The tradition of the Saloon in England is based on a quieter sit-down Pub experience favored by the English upper class. The Pub was for the working class to dash in for a quick pint on the run, the Saloon was for an unhurried special beer or a whisky shared with friends and neighbors in conversation. The Mad Fox Saloon follows the tradition with a working fireplace, banquette seating along the wall, bar stool seating along the street-side window and table seating in the center. The special feature of the Saloon is the Stammtisch table adjacent to the fireplace. The Bavarian tradition of the Stammtisch table is for dedicated regulars (Stammtischers) to always have a seat at the communal table. Mad Fox extends this concept and encourages groups to reserve the Stammtisch tables for weekly social and business meetings. The two 96 inch long Stammtisch table seat 8 patrons each and can be booked separately or together to accommodate up to 18 patrons. We can add up two additional standard tables to accommodate up to 22 patrons. The banquette adds 18 dining seats and there are an additional 10 bar stools along the window with bar-style seating, for a total seated capacity of 50. The Saloon, along with the adjacent West Broad Street Terrace, is physically separated from the rest of the restaurant and can be reserved for special events. It’s perfect for lunch meetings and celebrations as well as after work events. The Mad Fox outdoor Terrace area has two distinct spaces – the Market Square Terrace and the West Broad Street Terrace. The Market Square Terrace has fair weather dining on a quiet market square. The West Broad Street Terrace is an extension of our Pub and enjoys a high energy setting along the City of Falls Church’s main street. Very excited you guys are opening so soon! The closest thing I have to a local bar is “The Forrest Inn” at Westover and those people are scary! If you have a kids menu can you please make sure you include fresh fruit as a side option? I can’t wait for Mad Fox to officially open! I’ve already started planning a few happy hours with friends & coworkers for later this summer. Will all the items on the menu (appetizers, entree, dessert, etc.) be available for take out as well? Heard you were opening on Monday at 11.00 for lunch. Jane, we’ll let folks know when we open. We’re still deep in training this weekend. Cheers! Will you be doing growler fills at the restaurant? Will do, as soon as we get our growler labels approved and in-house. They are shipping as we speak. We’ll do a newsletter/Facebook/Twitter post when we start filling growlers – $9 standard refills, $12 refills for beers over 8%. Cheers! Sweet! I’ll be there with growler in tow. I had a Pig and Garlic pizza Monday, a beer sampler, and a pint of cask Porter. Wow! If I had to construct a menu, yours would be it. Prices are VERY reasonable and the selection is great. Now the question. I do see you enable reserving the Stammtisch tables as well as entire rooms, but will dining reservations be available? If not, will you do allow ‘call ahead’ to get on the list? I generally understand why places don’t do this, but on my birthday last Saturday, I wanted wood fired pizza (you guys opened two days late for me) so we went to Comet Ping Pong. One hour wait. We called Paradiso and were told a 20 minute wait (but they don’t add you to a list) and during the 15 minute drive there the wait changed to an hour. Finally, we called Rustico from there and got on a call-ahead list and were seated within 10 minutes of arrival. What I’m saying is Vienna has nothing exciting and I don’t mind driving to a great destination- Falls Church is close enough. But I expect your popularity to exceed Dogfish Head and getting in there between 6 and 9 is nearly impossible. Jeff, we’re optimizing our service and getting waits below one hour. We may offer call-ahead in the future, but not yet. Come, get onthe list, grab a pint and say hi. Cheers! We at there Wednesday night, and the food was excellent. Eleven of us at two tables, and everyone totally enjoyed what they ordered. I do think you need to put a few more larger tables together. I saw lots of several families there Wednesday night, and it’s tough when most are tables for four. We’ll be back! Glad you enjoyed it! Our large tables have been extremely popular. We actually had to return some of our tables due to shipping damage and should have all of our tables in place by the end of July – that will help. We do have tables for 6 and 8, but they fill up fast and early. We’re trying to stay away from that beer hall look, but demand my push us in that direction. Ate there Friday with my wife and 2 daughters (3 yrs and 3 months) and we loved it! Yes, there was a wait but the staff was very good about setting expectations, kept our drinks filled and even brought out my daughter’s hamburger before our food so she was happy. Ran into 4 sets of neighbors during the course of our dinner and all of us agree that this place is here to stay! So happy to have you guys here in the City, we really needed you. Chances are good you will see me and my family just about every Friday. Went there last night to celebrate a friend’s birthday (growler in tow, as I’d promised above!) and was not disappointed. Our table started out with the Fried Green Tomatoes and the Frickles. Of the two, the Frickles were a huge hit, with their spicy dipping sauce. For entrees, two of us had the black bean burger, one had the chicken panini, and one had the fig and bleu cheese pizza. I’ll comment on the black bean burger, since that’s what I had. The taste of the burger was wonderful. It was complex and slightly spicy. On sight I could tell it was a hand-formed patty, obviously made from scratch that day and shaped after I’d ordered. The pickled onions added a complimentary sweet and tangy crunch and the pesto was a nice addition. It came with a generous portion of what I assume were handcut fries with a side of homemade ketchup. All in all it was quite filling and made this vegetarian pleased. The consistency of the black bean patty needs some work, however. When cutting the sandwich in half with a table knife, the burger oozed out of the sides of the bun and onto the plate. When taking bites of the sandwich, the black bean portion had the texture of a thick hummus and didn’t hold together well as a burger patty. It seemed to be missing a binder or perhaps needed a bit more bulger wheat to help it stand up. This did not effect the flavor in the slightest, though. It was still fantastic and I think that the consistency issues will be worked out. Our server, Amy, was fantastic, knowledgeable, and honest. When we asked her a question about a dish she hadn’t tried, she plainly admitted she had not personally tasted that particular dish, but told us what she knew about it and offered to get us any other answers we needed. Our table tried almost all the draught beers and I’m going to leave a review of the two I tried (and the growler I filled) over on the “Beers” page. Dear Chefs: It flies in the face of all reason and all that is Good in the world that the scallops are gone, yet the awful Black Bean Burger continues to exist! We CAME there for the beer AND the scallops. Make them an entree if the appetizer price was a problem… say, 5 of them for $20 or $22 with whatever vegetable sides. Please, please, please bring back the scallops. Thanks for the heart-felt request! Scallops will make an appearance as a special. It was on Saturday night and sold well. As a menu staple it was often challenging for us to sell enough. But, as a special they do well. Cheers!